Titanosaurus indicus a Sauropod, is the first dinosaur to be discovered in India. It was found in place called Bara (big) Simla hill near the army camp in Jabalpur. This dinosaur is one of the giant herbivores of the Cretaceous period. The fossils of Titanosaurus and some other dinosaur have been discovered around the large area of Narmada river. Jabalpur army camp has another hill close to Bara Simla hill is Chotta (small) Simla hill. As u climb up the Chotta Simla hill, broken pieces of fossil bones can be found. At the foot of the hill under the boundary walls of the Gun Carriage Factory, it is one of the India's largest artillery and armaments factories.There is a temple called the Pat Baba mandir dedicated to Hanuman and other Hindu gods. The temple protects the fossils of bones, eggs and nests that were discovered from the hills. 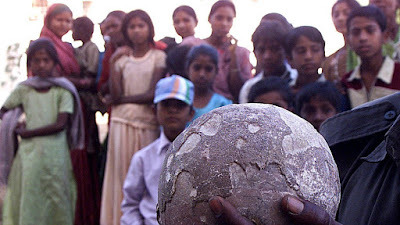 The followers offer protection because they believe that these fossil eggs are the demons slayed in the forest by Lord Shiva. Unfortunately, many eggs and fossils were damaged and lost during the temple renovated in 2011. Now only few fossils are there under the protection of those temple priests. Not only Titanosaurus, small carnivorous dinosaurs like Indosaurus (defines Indian lizard) and land crocodiles like Laevischus (defines light crocodile) lived in the dense forest along the river Narmada. Another killer dinosaur found was Indosuchus. It is massive dinosaur which had a skull of one meter and with the sharp font teeth of 10 cm length. The fossil of this dinosaur have been found in many parts of Narmada and the pieces of backbone found in the limestone beds of Ariyalur district of Tamil Nadu. The fossils of another ferocious species is found in the place called Hill Temple close to the river Narmada. They took 8 months to clean and assemble the bones of this dinosaur. It was named as Rajasaurus narmadensis (defines king lizard of Narmada) . Even it is smaller than Tryannasaurus rex, it is wilder and more aggressive. The structure of the dinosaur shows that it has the ability to act quicker and bite stronger than T.rex.